The Old Testament disease category sara’at may include a wide variety of skin diseases and may also include what we recognise as modern day leprosy. Before 1980, no skeletal evidence had been found for leprosy in this region, but in 1980, several cases were reported from the Egyptian Dakhleh Oasis dating to the Hellenistic period (200 BCE) (Dzierzyzkray-Rogalski 1980). The skeletal remains were of Caucasians buried in a Nubian cemetery. The Monastery of Saint John the Baptist, near the Jordan River was a traditional place for the washing of people with leprosy. Here Naaman, the commander of the Syrian army, was healed of his “leprosy” in the Jordan River (2 Kings 5), here too the Israelites’ forded the Jordan to enter into the Holy Land, and here Jesus was baptised by John the Baptist. These traditions add a certain sanctity to the site. Samuel Mark argues against the theory that Alexander’s troops contracted leprosy in India between 327-326 BC and brought it back to the Mediterranean. This theory of the spread of leprosy by Alexander the Great’s soldiers was originally proposed by Johs Andersen in 1969. (He also argued that Pompey’s army introduced leprosy after the campaign against the Mithridates of Pontus in 62 BC.) 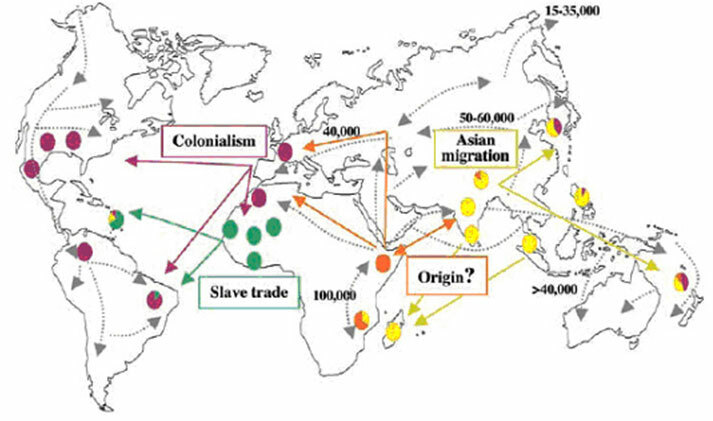 Instead Mark argues that cargo ships carrying young slaves from India to Egypt brought the disease to the Mediterranean world no earlier than 400 BCE. Mark argues that “the evidence suggests that leprosy did not exist in the Mediterranean region before the fourth century BCE and the four centuries from when it was first described to the time of Aretaeus is consistent with the time necessary for it to have spread, been observed, and described in relative detail.” (Samuel 300) No doubt further genetic analysis of the strains of M. leprae will eventually clarify these theories. The first important figure in the history of the Arab world who probably suffered from some form of leprosy was Jadhimah al-Abrash or al-Waddah, the king of al-Hirah who played a role in the politics of Syria and Iraq in the second quarter of the third century AD. There are also two famous pre-Islamic poets who may have had leprosy: Abid ibn al-Abras and al-Hārith ibn Hillizah al-Yashkuri, who wrote the seventh of the Mu’allaqāt. He recited the poem behind hangings so that the king would not be exposed to the sight of his disease, but Amr ibn Hind ordered the hangings to be removed because of his talent. From Islamic times, in two places the Qur’an mentions the healing of those with leprosy (al-abras) by Jesus. Pious sayings about leprosy attributed to the prophet are as follows: “a Muslim should flee from the leper as he would flee from the lion” and “a healthy person should not associate with lepers for a prolonged period and should keep a spear’s distance from them” (895). *1 Countries in the WHO Region are Afghanistan, Bahrain, Djibouti, Egypt, Iran (Islamic Republic of), Iraq, Jordan, Kuwait, Lebanon, Libya, Morocco, Oman, Pakistan, Qatar, Saudi Arabia, Somalia, Sudan, Syrian Arab Republic, Tunisia, United Arab Emirates, Yemen. A Asilian, G Faghihi, A Momeni, M R Radan, M Meghdadi, and F Shariati, Correspondence to the Editor, International Journal of Leprosy 73.2 (2005):129-30. T Dzierzykray-Rogalski, “Paleopathology of the Ptolemaic Inhabitants of Dakhleh Oasis (Egypt)”, Journal of Human Evolution 9 (1980): 71-74. Mohamed Abdel Khalik El Dalgamouni, “The Antileprosy Campaign in Egypt” 6.1 (1938):1-10. Samuel Mark, “Alexander the Great, Seafaring, and the Spread of Leprosy” 57 (2002): 285-311. “Resolutions and Reports of the International Congress of Leprosy Held in Cairo March 21st-27th, 1938” Reprinted from The Journal of the Egyptian Medical Association” 31.3 (March 1938). H W Storm, “Leper Survey of the Arabian Peninsula” Leprosy Review 10 (1939): 85-88, cited in World Wide Distribution and Prevalence of Leprosy Supplement to International Journal of Leprosy 12 (1944): 13. The Biblical Archaeologist, 54.3 (1991): 146-159.